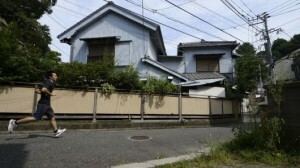 Japan has an increasing number of vacant homes — a problem that's set to persist because of an aging and shrinking population that has left many towns and villages empty. "Japan faces significant economic and social impact effects from demographic (aging) over the next three decades," Rajiv Biswas, Asia-Pacific chief economist at IHS Markit, wrote in an October note. U.S. home prices have climbed back above the record reached more than a decade ago, bringing to a close the worst period for the housing market since the Great Depression and stoking optimism for a more sustainable expansion. The average home price for September was 0.1% above the July 2006 peak, according to the S& P CoreLogic Case-Shiller U.S. National Home Price Index released Tuesday. The previous month’s reading of the Case-Shiller index, a widely used benchmark for U.S. housing, showed prices remained 0.1% below the 2006 record. Adjusted for inflation, the index still is about 16% below the 2006 high. Home prices jumped 5.5% over the past year. The record caps a four-year recovery from the trough of 2012, when prices sat 27% below the peak after a crash that caused more than nine million American families to lose their homes. “It’s good news for homeowners out there, especially ones who were able to cling on to their homes,” said Svenja Gudell, chief economist at Zillow, a real-estate research firm. “They saw one of the biggest assets that they had lose a ton of savings.” But while prices have recovered, the market is flashing caution signs. The country is building far fewer homes than normal, the homeownership rate is near a five-decade low, and mortgages remain difficult to come by, especially for lessaffluent buyers. Rising mortgage rates could also begin to pose headwinds to further price growth. Home-price growth has also outpaced income gains, making it more likely that the current rate of appreciation is unsustainable. 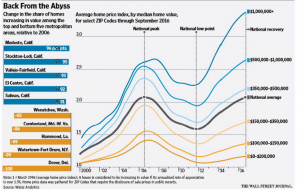 Home prices have grown at an inflation-adjusted annual rate of 5.9% since 2012. New study confirms economy was destroyed by Democrat policies. Why some homeowners are turning down free money. U.S. Homeowners Are Repeating Their Mistakes. 3/6/12 •What Made the Financial Crisis Systemic?